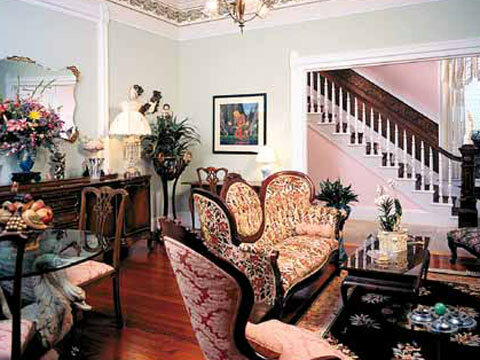 Step into Marrero's Guest Mansion and step back in time to a more relaxed era. Rich in history and steeped in mystique. Enjoy the grandeur of our elegant Victorian mansion, carefully updated and lovingly converted into a charming Marrero's Guist Mansion Porch Key West bed and breakfast inn featuring true island hospitality, while maintaining the original architectural detail. Built in 1889 by Francisco Marrero, a prominent cigarmaker, the home's objective was to lure his young love to the island. The charm must have been successful, his bride is said to enjoy the home beyond her life. Some believe she still moves through "her" house at night keeping a benevolent eye on things. Today you too can fall for the lure of the mansion's serene, topical setting. Located in the very heart of Old town, Marrero's is literally steps from everything you come to Key West for. Explore the real Key West on foot or bicycles, the way it was meant to be, relaxed, fun and delightfully different. Duval Street's attractions are a short half block away. Sample great restaurants, tropical shopping, art galleries and famous clubs and pubs. Water sports, beaches, snorkeling, sailing, fishing and dive trips, sunset cruises and even sea plane flights are all close at hand. Whether its information about daytime excursions, reservations for dinner or a play, or simply the latest tips on Key West's legendary night life, our attentive staff can help arrange everything. Accommodations range from spacious guest rooms with sleeping and sitting areas to bedrooms with verandahs. All updated to offer the luxurious comforts and conveniences you expect. In the morning, follow the wonderful aromas of a full continental breakfast featuring coffee, fresh fruit, juices, pastries & much more. * Restored Victorian mansion * Centrally Located (1/2 block to Duval Street) * Expanded continental breakfast * "Happy Hour" daily * Tropical gardens * Large heated swimming pool * Clothing optional pool area * In-room refrigerator, air conditioner, color cable TV & telephone w/voice mail & data port * WiFi internet access * All rooms non-smoking * Outdoor shower * All welcome. All adults (21+). No pets. * Inquire for parking availability.